In September 2017, Games Workshop released a series of 12 + 1 Space Marine Heroes, randomly packaged in sealed blind boxes, exclusive to the Japanese hobby market. All models feature unique dynamic poses, sculpted bases, and a bare-headed and helmeted head option. 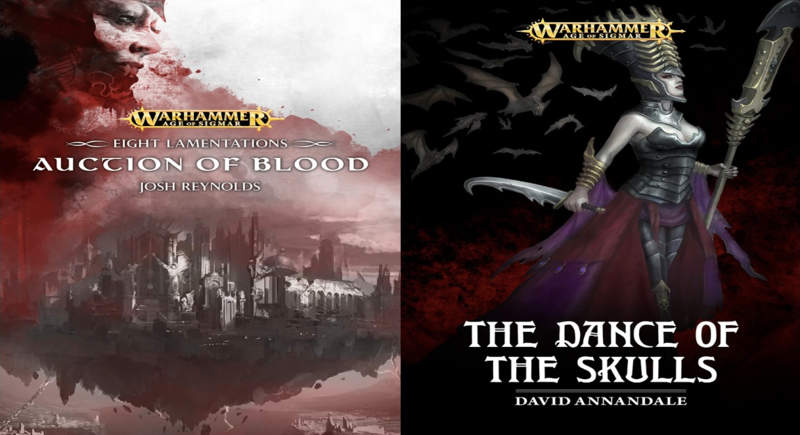 The series is already sold out in Japanese online stores, however, in November 2018, Games Workshop released Series 1 in the rest of the world - with a few revisions. Check out if the models are worth the hassle. One display box contains 24 sealed blind boxes, priced at about 700 yen plus tax each. There are 12 different models, 10 regular ones and 2 "secret" ones. The ratio is fixed, and one display box contains each model twice. The rarity of the secret models is exactly the same, I guess they are just "secret" for the extra surprise factor. The display box is designed like a Rhino, which is pretty cool. 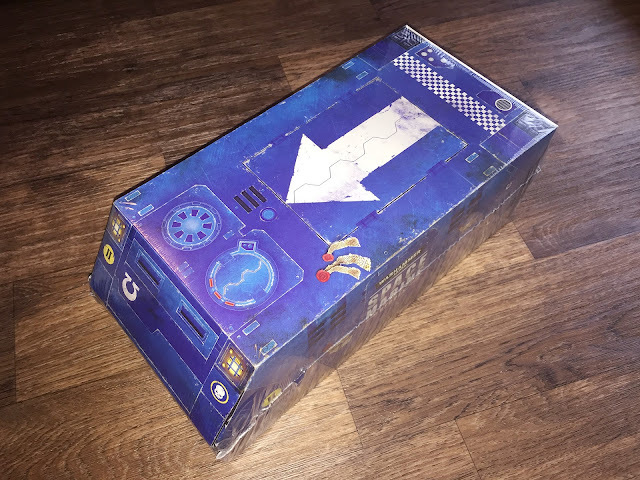 Sadly it's hard to use the box for anything other than displaying the blind boxes, as the top lid isn't connected to the box but comes off completely. © Games Workshop. Image used without permission. 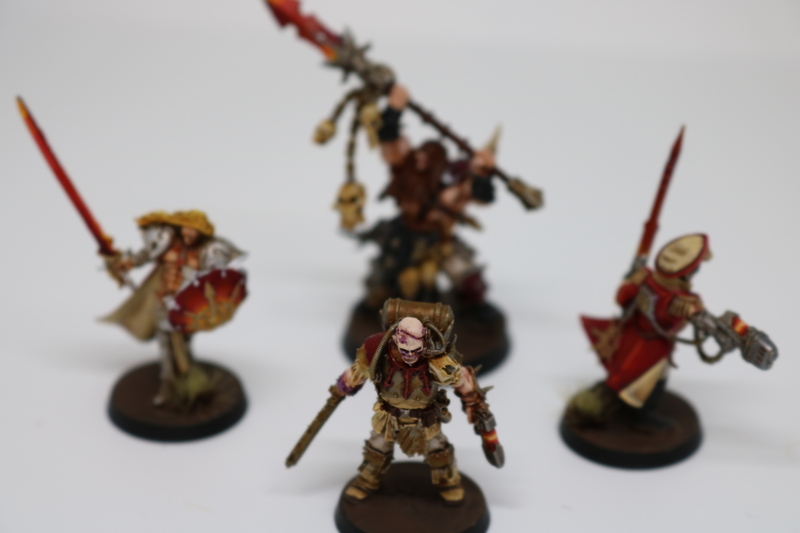 Here you can see all the models in their 'Eavy Metal painted glory. Remember, there is a choice between a bare head and a helmet for every model. We got a Sergeant, eight Marines with Bolters, a Marine with a Flamer, a Marine with a Plasmagun (secret model Brother Promethor), a Marine with Rocket Launcher, and a Marine with Heavy Bolter (secret model Brother Toriad). Here are clear pictures of Toriad and Promethor. Toriad has reinforced armour like Remus and a cool Heavy Bolter variant with a box magazine, while Promethor sports a bionic arm and a spare plasma ammunition cell. Upon closer look, these are not just the same models you get out of a Tactical Squad Box. 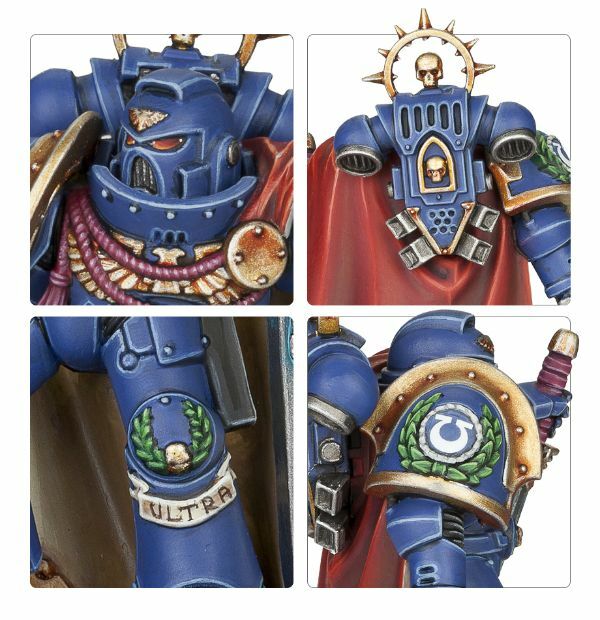 They all have unique details, like pouches, spare ammunition, grenades, variant bolter patterns, holsters, and necklaces. Plus, all sport dynamic poses with slightly twisted torsos. Each model comes with a unique 32mm display bases, featuring rubble and skulls (Promethor even has a Tyranid skull on his base!). Update November 2018: The "rest of the world" edition of Space Marine heroes features only 9 of the 13 sculpts of the Japenese edition. Toriad (Heavy Bolter), Calistus (Flamethrower), Dolor (Auspex) and Aethor (running with combat knife) are missing. 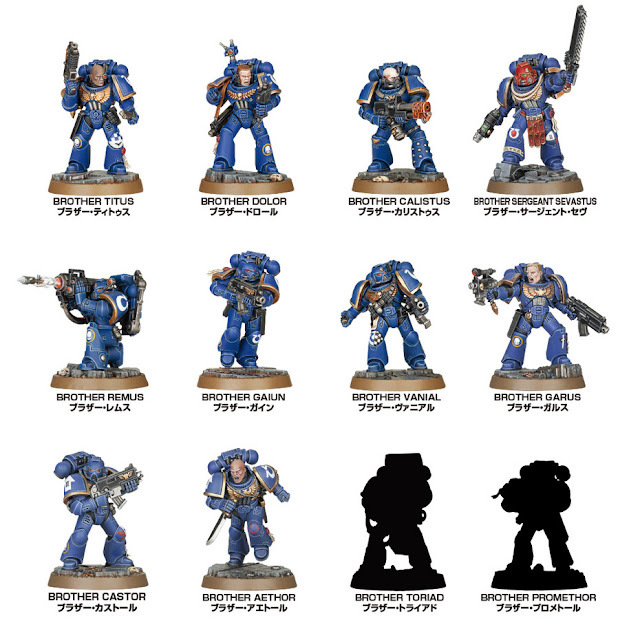 These models can all be found in the Space Marine Adventures board game though (if you're lucky to have it available in an outlet in your country). The Captain is part of the blind boxes, not a separate promo model. However, unlike the Japanese edition, the ratio of the models is not even. Check out the front of the display above. For example, the Sergeant, so you can find one Sergeant in a fresh display of 12 boxes, while the Captain is a chase model with a ratio of 1:36, so only one Captain in three displays. The basic bolter slinging Marines are either 1:6 or 5:36, so you will find two or three of them each in a single display box. I expect the value of the rarer figures skyrocketing on ebay. There is a thirteenth model, not part of the blind box range, Brother-Captain Thassarius. He is a promo model, only available in participating shops, and apparently on GW.com Japan. 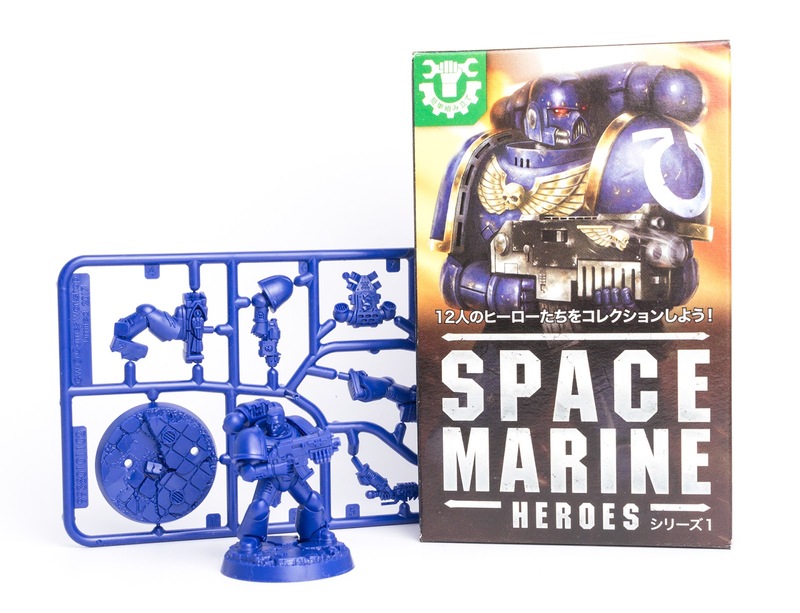 From what I have gathered, his RRP is 3000 yen plus tax, so roughly in line with other plastic Space Marine character models, but much more expensive than the regular blind box models, even though his sprue is the same size. He is wearing a suit of Mk8 armour similar to the Deathwatch Kill Team models and is armed with a power sword and plasma pistol. Truth to be told, I find his pose and design a bit bland. His only redeeming quality is his suit of armour, as he is the only Captain model in Mk8 power armour so far. 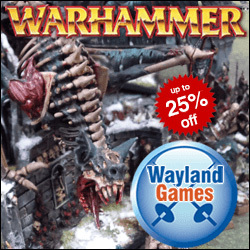 © Games Workshop. Images used without permission. Now let's take a closer look at the contents of a blind box. Each blind box looks the same (obviously, so you won't know which model will be inside) and is sealed. 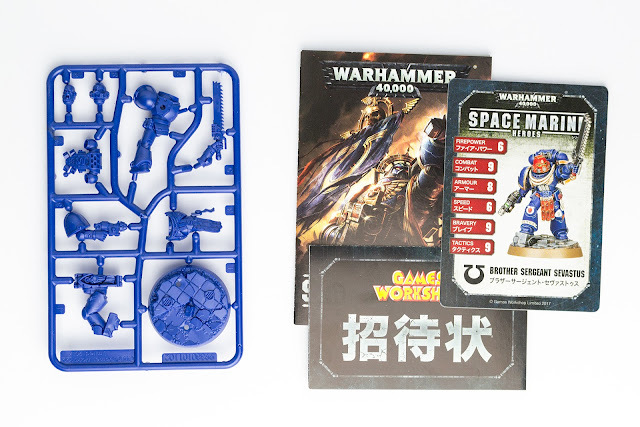 Once opened, you will find a random Marine on a sprue cast in blue plastic, an assembly guide, a 40k advert and a (rather flimsy) collectors card. 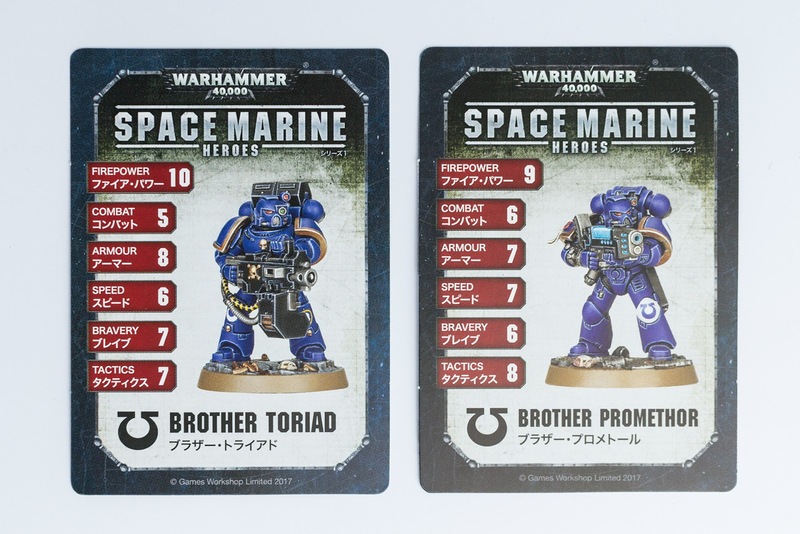 The cards feature some background and artwork for each Marine, sadly in Japanese only. The plastic is the same quality as regular Games Workshop models (in fact, the box says Made in England). Aimed at first-time buyers, the models are push fit and don't require glue. All pieces are connected to the sprue with extra thin vents, so you can easily remove them with just your fingers. Like modern character models, the pieces are laid out on the sprue very cleverly, allowing a wealth of detail with almost no unsightly undercuts visible. However, the feet are often connected to the bases, and the arms and shoulder guards are often connected to the body, which makes converting and weapon swaps a bit difficult. For this review, I assembled Brother Castor, a regular Marine with Bolter. Maybe not the most exciting model from the range, but his fairly standard pose makes him perfect for comparing with other Space Marine models. Assembly was nice an quick. I used glue apart from the heads. The heads come on pins, so you can easily change between both options without the need for magnets. Here comes the scale comparisons. 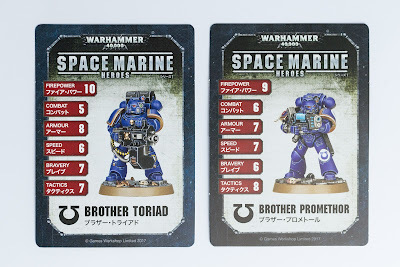 On the left, we have a model with Deathwatch Kill Team Mk8 legs and Mk8 torso from the Tactical Squad kit (2015), Brother Castor, and a Primaris Marine on the right. 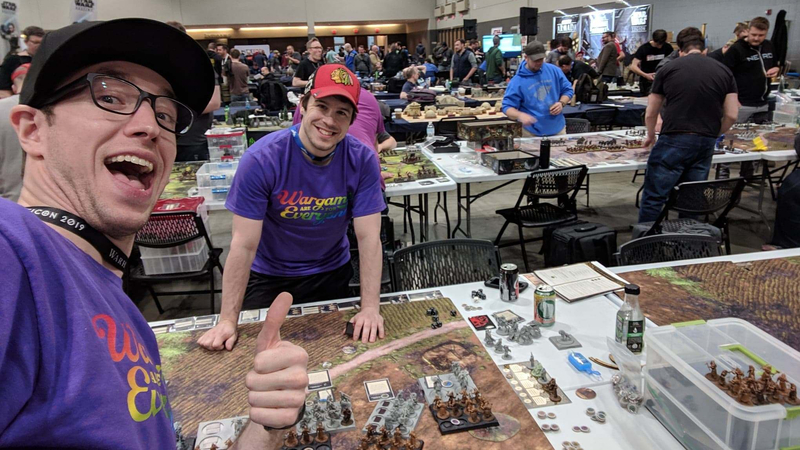 From left to right: a Marine in Mk6 armour (Tactical Squad 2015), a Marine in Mk4 armour (plastic), Brother Castor, and a Marine in Mk3 armour (plastic). Remember that Brother Castor's scenic base adds a millimeter or two. As you can see, Space Marine Heroes seem to be slightly taller than regular Marines. The upper bodies are the same, but the legs are slightly longer and beefier, and posed more upright, like the Mk8 armour Deathwatch Kill Team models. Also, the sculpted bases add a little bit extra height as well. 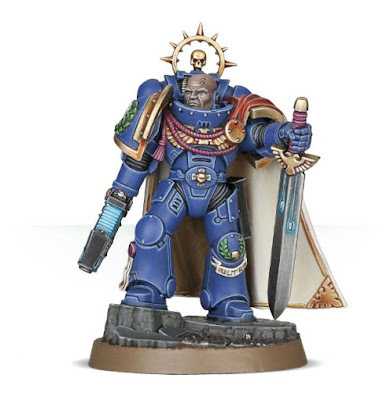 They won't look out of place in existing Space Marine collections, though they'll stand out a little bit right next to older Tactical Marines. Personally, I really enjoy both the blind box concept and the design of the models. Maybe they resonate so strongly with me because they'll probably the last non-Primaris Marines we'll see in a long time? Obviously, some people will say they look exactly the same as any other Marine models before, but die-hard Marine fans will enjoy all those newly sculpted little bits and extra touches. 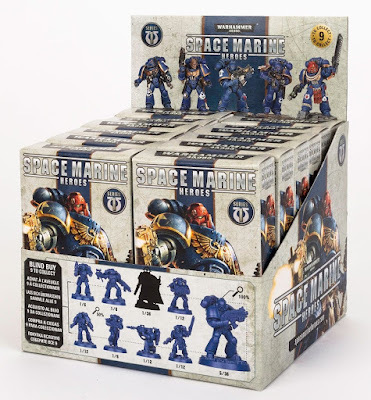 They make great pocket-money buys and are a fun addition for any Space Marine collection. Series 2 with Terminators is already out in Japan, I wonder if we see a Primaris themed Series 3 soon? I managed to get a box by signing up to a mail forwarding company and ordering a box off Amazon Japan. With the shipping costs and customs fees, it came to around £205 for a display box. Not sure what the eBay sellers are charging! I bought mine from ebay for 260 dollars (including the Captain and free international shipping). Thankfully I didn't have to pay customs fees, somehow it went through unchecked. where can i them in the USA at all? Only chance is to check ebay. The ones missing from the now released UK series 1 set are available in the Space Marine Adventures: Labyrinth of the Necrons game. Which annoyingly is a US only item at the moment, so completing my set is all the harder! If you want the series 2 though, you can get the main 6, excluding the painting set only banner holder terminator for between £45 - £70 depending on the kind of expedited shipping you want, through Japanese sellers on ebay. You can buy them from UK vendors, but at a much increased premium. Thanks for this, I was looking the other day for the difference between the Japanes release models vs the rest of the world models.